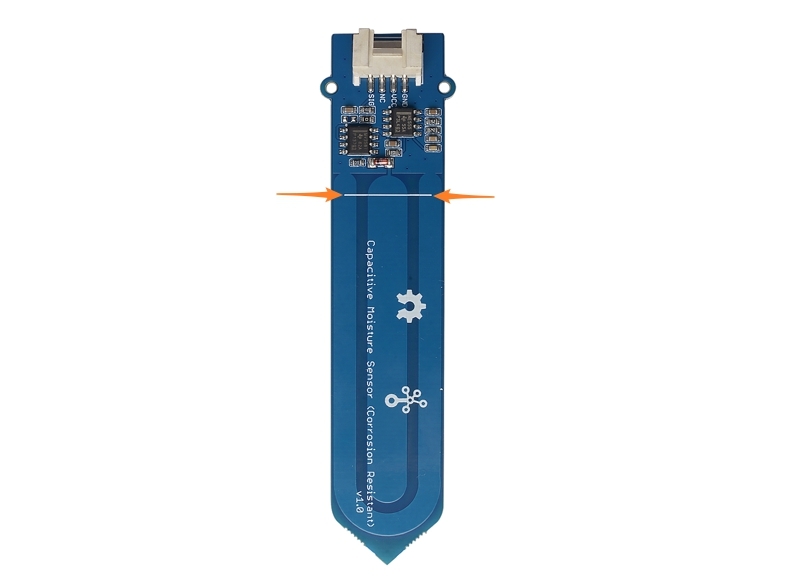 The Grove - Capacitive Moisture Sensor (Corrosion Resistant) is a soil moisture sensor based on capacitance changes. Compared with resistive sensors, capacitive sensors do not require direct exposure of the metal electrodes, which can significantly reduce the erosion of the electrodes. Hence, we call it Corrosion Resistant. It is important to note that this sensor can only qualitatively test the humidity of the soil and cannot measure quantitatively. Which means when the humidity of the soil rises, the value of the output decreases; conversely, when the humidity decreases, the output value becomes higher. 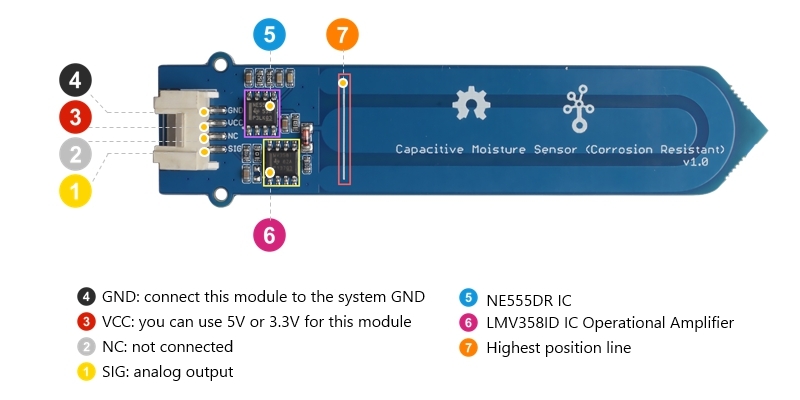 The part of the sensor inserted into the soil cannot exceed the highest position line. The platforms mentioned above as supported is/are an indication of the module's hardware or theoritical compatibility. We only provide software library or code examples for Arduino platform in most cases. It is not possible to provide software library / demo code for all possible MCU platforms. Hence, users have to write their own software library.To do means not be supported now, may or may not be supported in the future. 1. If the you uses Arduino UNO as the motherboard, it is recommended that use the DC power supply. Otherwise, the maximum ripple of VCC may exceed 100mV. If you use Seeeduino V4.2 as the motherboard, you do not need to connect DC power. 2. Hot swap is not supported. Step 1. Connect the Grove - Capacitive Moisture Sensor to port A0 of Grove-Base Shield. Step 3. 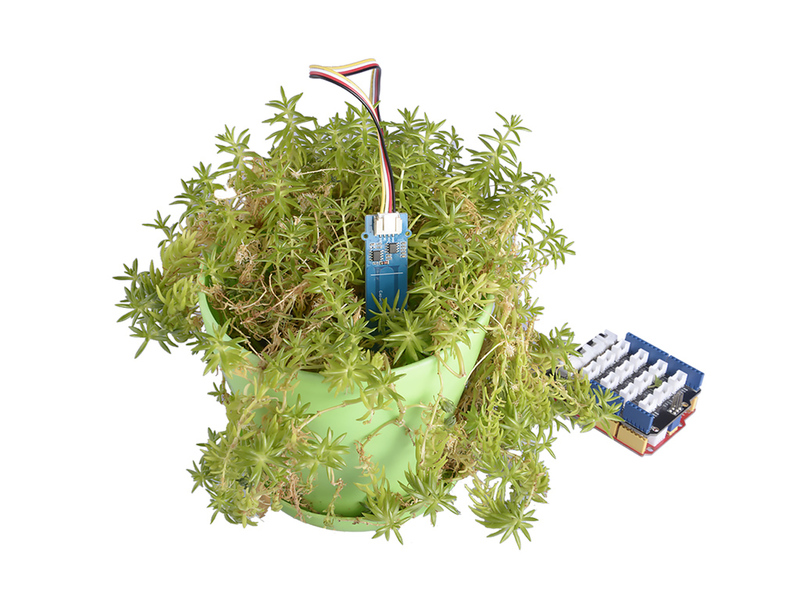 Insert the Grove - Capacitive Moisture Sensor into the soil to be tested. The part of the sensor inserted into the soil cannot exceed this white line. Step 1. Copy the code below, and download it to your arduino. If you do not know how to upload the code, please check How to upload code. Step 2. 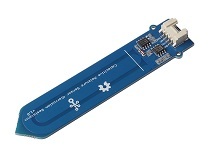 Open the Serial Monitor of Arduino IDE by click Tool-> Serial Monitor. Or tap the Ctrl+Shift+M key at the same time. Set the baud rate to 9600. Due to individual differences in components, different module measurements in the same environment may vary. And you can find the demo in the wiki of those hats.